Formative assessments are a vital part of any instructional model, and the 5E Model is no different. … any sort of activity in which the intent is to inform instruction by checking for understanding. … just numbers to enter into the gradebook or something to keep students busy at the end of class. 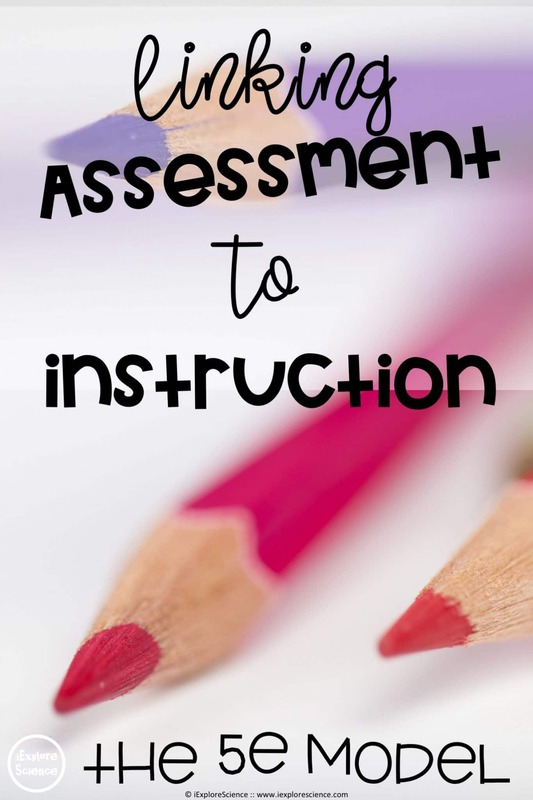 These assessments should be used to guide instruction — to determine what misunderstandings still remain, where students need additional practice, and what concepts need retaught. Formative assessments can also be used to activate prior knowledge to prepare the mind for learning, gauge interest in a topic or approach, or provide opportunity for student reflection. There are a number of wonderful books on formative assessment for the science classroom, but one of my favorites is Page Keeley’s, Science Formative Assessment: 75 Practical Strategies for Linking Assessment, Instruction, and Learning. I’ve compiled a few of my personal favorites for you in this post. Predict-Explain-Observe asks students to make predictions based on their common-sense interpretations of phenomena. It elicits their prior ideas, gives voice to that understanding through the explanation, and then engages students in the science and engineering practice of designing and carrying out investigations to actually test those ideas. It is important to target learning goals that can be tested using simple materials. Carrying out a short investigation to test the students’ predictions is key to this technique. There are a number of ready-made probes in the Uncovering Student Ideas in Science series by Page Keeley, but you can always create your own. Present students with a scenario and ask them to make a prediction about what might happen. Then, ask them to explain their thinking — why do they think that will occur? Lastly, carry out that scenario to test student ideas. Through discussion, students can revise their ideas and generate additional questions to drive the instructional sequence forward. When you present the scenario, you can have the supplies in front of you or you might use a cartoon or other visual to engage students. Students may generate their own predictions, or you may provide options to choose from “presented by” characters in the scenario. Grab my graphic organizer in my TeachersPayTeachers store. Annotated student drawings (ASD) is a strategy that can be used before instruction to assess student’s initial ideas about a phenomenon or after instruction as a way to publicly share their thinking. Students can also use this strategy to reflect on their own learning, if they are given the opportunity to examine their first drawings and consider how their understanding has changed. To implement this strategy, the teacher will present students with a scientific idea or concept and ask students to create a drawing to illustrate what is happening. They will use annotations (captions) to provide additional information about what is occurring in their picture – key ideas, important words, so on. Ensure you have chosen a concept that can be easily illustrated. This does not mean it has to be visible — asking students to “zoom in” or “zoom out” on something that cannot be seen by the naked eye actually makes a wonderful concept or phenomenon for this activity. That said, a prompt like “draw a picture to show how the universe formed” may be a bit much for one drawing. This task can be completed by students individually or in small groups. If students are working individually, I recommend they keep this drawing in their notebook and return to it to revise or confirm their understanding as they move through their learning activities. If students are completing these task in small groups, you will want to find a way to hold all students accountable. I have found that assigning marker/pen colors to individual students is one way to determine each student’s contribution to the drawing. That said, that approach does not account for verbal contributions if students prefer not to write, so you may need to find a method that works for your students specifically. After groups have completed their drawings, feedback from peers can be offered through a gallery walk approach. Feedback can focus both on the clarity with which the group has explained the concept in addition to the scientific “correctness” of the illustration. This skill should be modeled the first time students participate in a concept card mapping activity. When modeling, it will work best if you use a familiar topic that students find engaging. I would recommend limiting the number of concepts to 7-10, and keep their descriptions short – one to three words. The phrase should represent a scientific idea like ecosystem, boiling point, or erosion. To use Concept Card Mapping, present students with a handful of concepts. You can place these in boxes on a piece of paper or on sticky notes or on cards that students will glue themselves. Allowing students to move the cards can provide an additional level of analysis. Students will draw lines to connect the concepts and on those lines, record a note about the connection. This can be used as an individual or group activity. If students are working in groups, determine how you will keep all students accountable. One strategy is to assign each student a different color pen or pencil to quickly identify contributions. Lastly, you can provide pictures in addition to words. This can help younger students, English Language Learners, or others with reading impairments. You could also provide examples of connectors if students are struggling with ways to describe the connections. Model Analysis is an amazing way to tie in the Science and Engineering Practice of Developing and Using Models while simultaneously assess student understanding of Disciplinary Core Ideas. In Model Analysis, students are given a model or representation — think a diagram of the water cycle, a to-scale three dimensional model of the size of the planets, or a picture of a plant cell — and asked to evaluate whether it is an accurate representation of the object, situation, or concept it was created to convey. By identifying the strengths and weaknesses of the model — its accuracies and its limitations — students are demonstrating their own understanding as well as revealing whether they may still have misconceptions that are reinforced by these representations. It is important to preface this activity with a discussion that flawed representations often go unnoticed by teachers, students, and the public at large. We must be discerning when viewing visual representations of ideas and phenomena, keeping in mind that models and representations always have their limitations. Even when we may make a concerted effort to be as accurate as possible, it is not always possible to represent all features accurately. Model Analysis can be used with any piece of content that can be represented visually. You can choose representations or illustrations from textbooks, the Internet, student work, or even pieces of data like charts, graphs, and diagrams.